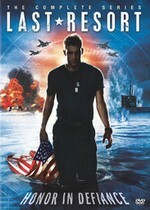 Last Resort: Mystery and Suspense on Television. 500 feet beneath the ocean's surface, the U.S. ballistic missile submarine Colorado receives their orders. Over a radio channel, designed only to be used if their homeland has been wiped out, they're told to fire nuclear weapons at Pakistan. This ABC action thriller premiered in Fall 2012 and aired for only one shortened season.